Despite overwhelming evidence that adherence to a healthy lifestyle plays a critical role in preventing, managing and reducing disease risks, less than 3% of American adults actually follow general principles of healthy living—a nutritious diet, moderate daily exercise, weight management and avoiding smoking. One problem contributing to this seeming lackadaisical attitude towards general wellbeing is that people are led to believe that there’s a pill to cure every ill. So much so that 55% of Americans take 4 different prescription medications daily, far more than citizens of any other country, and nearly 70% take at least one prescribed drug. 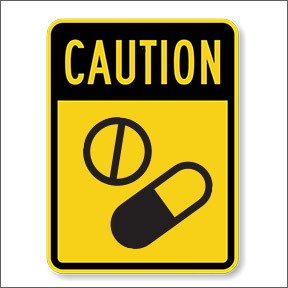 All drugs, whether prescription or over the counter, can have harmful side effects. Although some side effects, such as gastrointestinal issues, fatigue, and muscle aches, are considered minor; allergic reactions, heart palpitations, internal bleeding and organ failure may also occur. Many take additional medications to counteract side effects, while others who find side effects intolerable discontinue medications against medical advisement. There’s no doubt that certain medications are essential and enhance the quality of life. Others are lifesaving, treating potentially life-threatening diseases and infections. Some are life-improving, helping to manage chronic or debilitating conditions. Still others are life-prolonging, treating cancers and rare conditions. Per Thomas J. Moore, senior scientist for drug safety and policy at the Institute for Safe Medication Practices, barring overdoses and misuse, there is no formal process for quantifying injuries, hospitalizations, or deaths caused by therapeutic drug use. While consumers and healthcare providers are encouraged to report adverse reactions to the Food and Drug Administration (FDA), the agency says its unable to use this reporting data to quantify overall deaths that result from taking prescribed pharmaceuticals as directed. It would appear that simply taking prescribed drugs as instructed may potentially expose an individual to significant risks. Moore and other researchers, who closely evaluated hospital admission studies over several decades, reported their findings in the Journal of the American Medical Association (JAMA). Recent analysis estimates adverse drug reactions result in 1.5 to 2.7 million hospital admissions each year. Sadly, approximately 128,000 Americans die each year from taking medications properly prescribed by physicians. Other research suggests that half of those events were preventable. When medication is clearly necessary, always read the safely information that lists known side effects of the prescription. Some individuals may not experience any side effects. Those who do should report all adverse reactions to their healthcare provider, as there may be alternative medications that work equally well with fewer side effects. Those taking multiple medications are advised to be particularly cautious and weigh the benefits of the medications versus any potential harm. In certain situations, paying serious attention to improving lifestyle habits may provide a non-pharmaceutical intervention to improving health status, especially for borderline conditions such as prediabetes, osteopenia, prehypertension or even mild depression. Of course, prevention is always the best medicine. Healthy nutrition and lifestyle habits are known to greatly reduce the likelihood of developing chronic diseases. Oftentimes borderline conditions and minor health issues can be improved with dedication to taking better care of one’s health, improving one’s diet, and nutritional supplementation. Regular exercise is key to weight maintenance and maintaining cardiac health, as well as healthy blood pressure and blood sugar levels. Although it’s not easy to change unhealthy behaviors, the rewards of a healthier life today and the ability to function independently later in life are more than worth the effort required to improve long-term health. -Abundant research and a clear consensus support healthy lifestyle strategies in the prevention, management, and reduction of cardiovascular disease and its risk factors. -To address prehypertension, cut back on sodium, lose excess weight, exercise regularly, control stress, drink alcohol in moderation, and don’t smoke. The DASH diet is recommended for those with hypertension to help lower systolic blood pressure. -Weight loss if appropriate, a healthy diet and exercise can reduce blood sugar levels in prediabetes. If you are carrying excess weight and have been unsuccessful with weight loss, consider a formal weight loss program for diabetes prevention. -Back and joint pain can often be improved with physical therapy and appropriate exercise, such as yoga, tai chi, swimming and gentle stretching. Supplements such as MSM, hyaluronic acid and curcumin support joint tissue health and reduce inflammation. -Weight bearing exercise can slow the progression of osteopenia and encourage the body to build new bone cells. A whole food diet filled with calcium-rich foods is also advisable. Sufficient vitamin D is needed for the body to absorb and utilize calcium and other minerals. -Exercise therapy, as well as various forms of talk therapy, are valid non-pharmacological primary treatments for mild depression. Exercise temporarily boosts mood enhancing endorphins and may encourage positive rewiring in the brain. Certain supplements such as omega-3 essential fatty acids, B vitamins and 5-HTP may also be beneficial for mood support. MSM powder by Pure Encapsulations®: This naturally occurring patented formula provides 99.7% pure MSM, plus elemental sulfur, in support of healthy joints and connective tissues. Gluten and soy free, Non-GMO vegetarian formulation. Hyaluronic Acid by Pure Encapsulations®: This naturally occurring compound supports healthy joint lubrication and joint function. Additionally, hyaluronic acid supports skin hydration, nutrient delivery and proper cellular communication. Gluten and soy free, Non-GMO formulation. Curcumin 500 with Bioperine® by Pure Encapsulations®: Curcumin supports a healthy inflammatory response and supports healthy liver, colon, musculoskeletal and cellular function. Bioperine®, a black pepper extract, has the potential to enhance the bioavailability and promote the absorption of curcumin. If taking medications, consult a healthcare provider before supplementing with curcumin. 5HTP Supreme™ by Designs for Health: As a precursor to serotonin, the feel-good neurotransmitter, 5HTP may help to promote healthy mood and reduce food cravings. This formula includes an activated form of vitamin B6 for overall neurotransmitter support. Gluten free, Non-GMO vegetarian formulation. Active B Complex by Integrative Therapeutics: A highly bioavailable complex providing a full complement of B vitamins, this formula naturally boosts brain chemicals that improve mood, energy, concentration, visual clarity and alertness. Gluten, soy, dairy and artificial ingredient free, vegetarian formulation. This entry was posted in Home and tagged 5HTP Supreme™ by Designs for Health, Active B-Complex by Integrative Therapeutics, Curcumin 500 with Bioperine, Hyaluronic Acid by Pure Encapsulations, MSM Powder by Pure Encapsulations, Prescription Drugs - Proceed with Caution. Bookmark the permalink.